Ray Melville, heroine of Trouble at Melville Manor, who hopes to become a writer, spends a month at a holiday school in Vannes, Southern Brittany. During her stay, she comes to appreciate the French way of life, is immediately captivated by the picturesque Breton people with their traditional costumes and ceremonies, and learns how to get on with girls of conflicting personalities. The story describes brilliantly the impact of the colourful Breton background on a sensitive English girl to whom everything is novel and exciting. 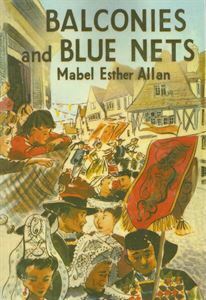 We shall be including in the book a short story by Mabel Esther Allan.